Zinedine Zidane insists there have never been any doubts over how “crucial” Karim Benzema is for Real Madrid following his match-winning brace against SD Eibar. The French striker came to the rescue for Real in what was a rather underwhelming display at the Santiago Bernabeu on Saturday afternoon. After Barcelona loanee Marc Cardona gave Eibar an expected first-half lead, Benzema headed in Marco Asensio’s cross to equalise in the 59th-minute. With nine minutes to spare, the 31-year-old struck again with another header to take his tally for this season up to 26 goals in 48 games. It marks a remarkable turnaround in fortunes for Benzema, who was being heavily tipped to leave Real last summer after only being able to find the back of the net 12 times in 47 outings. But Zidane, who admitted he’s struggling to motivate his players right now, never had any doubts over the importance of his compatriot for Los Blancos. “He’s always been crucial for the team,” said Zidane, according to Goal. “He’s scoring more goals now but he’s always been a hugely important player. I want to speak about the team. Benzema has scored four goals in Zidane’s opening four games back in charge of Real. 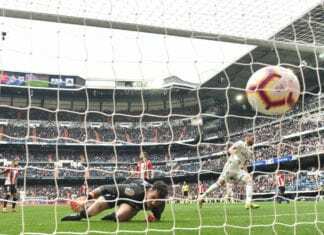 Despite the victory on Saturday, though, Los Merengues remain 13 points adrift of La Liga leaders Barcelona in third-place ahead of the final seven games. Although Real may be feeling a little inspired right now given that they’ve closed to within two points of local rivals Atletico Madrid for the battle of the runners-up spot. Diego Simeone’s side lost 2-0 to Barcelona on Saturday to effectively end their hopes of winning La Liga this season.